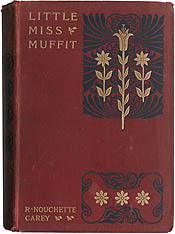 Rosa Nouchette Carey wrote about forty novels, many of which achieved great popularity. Her fiction focused on domestic and family themes, and her plots and characters generally reflected a conservative outlook. In her youth, Carey tried to quench her longing to write, believing that it was impossible to combine literary achievement with a useful domestic life. But her writing won out, and she never married. 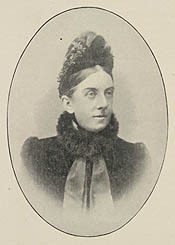 Although her literary reputation was not high, her works sold well, remaining in print from 1868 until 1924. [top] Portrait of Rosa Nouchette Carey. [bottom left] Rosa Nouchette Carey. Little Miss Muffet. London: Religious Tract Society, [1894?]. [bottom right] Rosa Nouchette Carey. 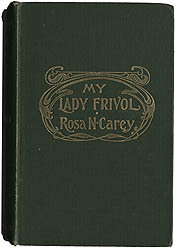 My Lady Frivol. London: Hutchinson, 1899.